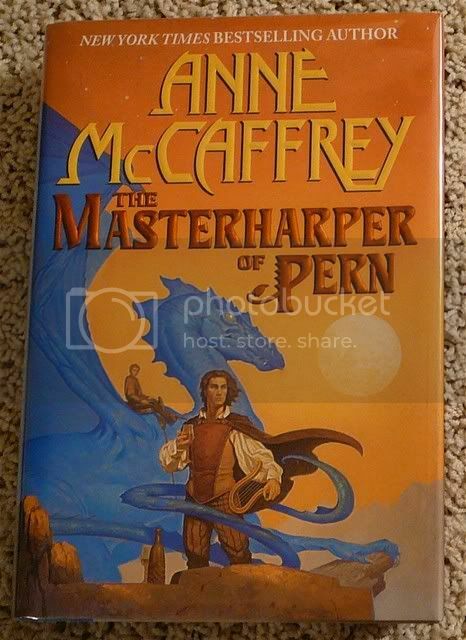 This highlight is about a collection within a collection all pertaining to the book The Masterharper of Pern published in 1998 by Del Rey. My copy is the US hardcover and the Brom art work on the cover is the focus of the mini collection. 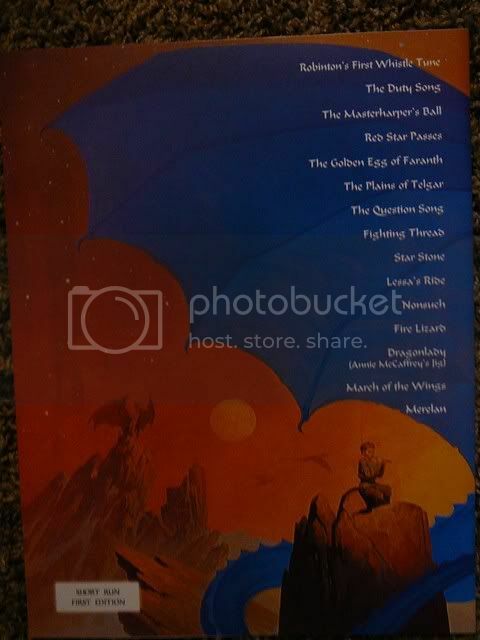 In 1998 Del Rey gave away calendars with the Brom cover art work from the book featured. I do not know how many they gave away. 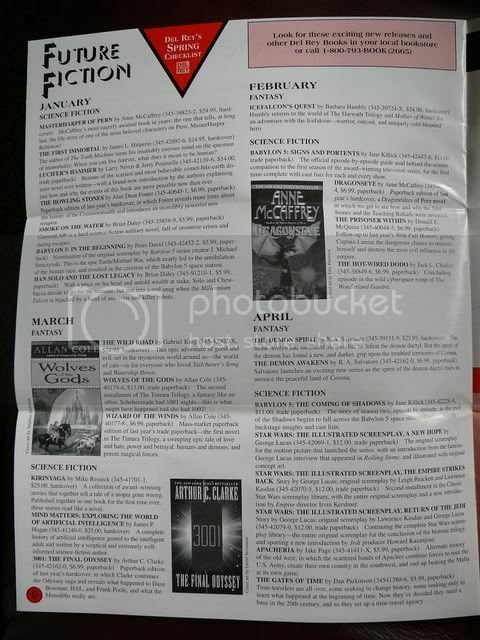 I was sent several of the calendars by a Del Rey rep for the AOL Anne McCaffrey reading group that I lead at the time. The rep actually located our group on AOL and offered the calendars and copies of their newsletter, DRINK as give aways. There were several lucky recipients of the calendars and DRINKs as prizes for little trivia games I ran. The front page of the DRINK also features the Brom artwork that is on each of the items I'm focusing on in this highlight. It doesn't hurt that there's an article about the Masterharper by Anne herself! 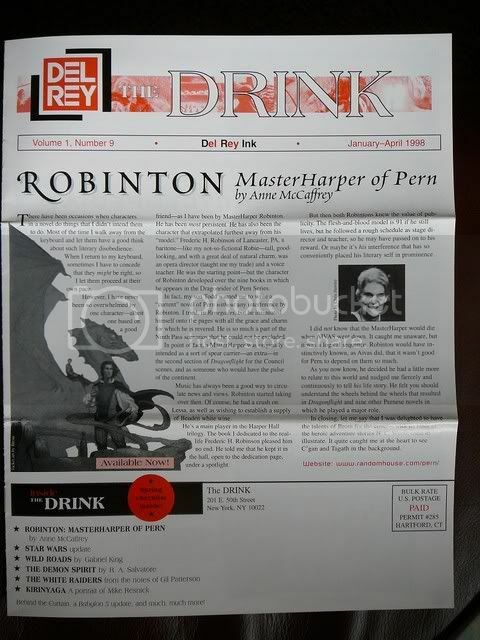 Inside this same copy of DRINK there is a blurb about the release of the Dragonseye paperback. 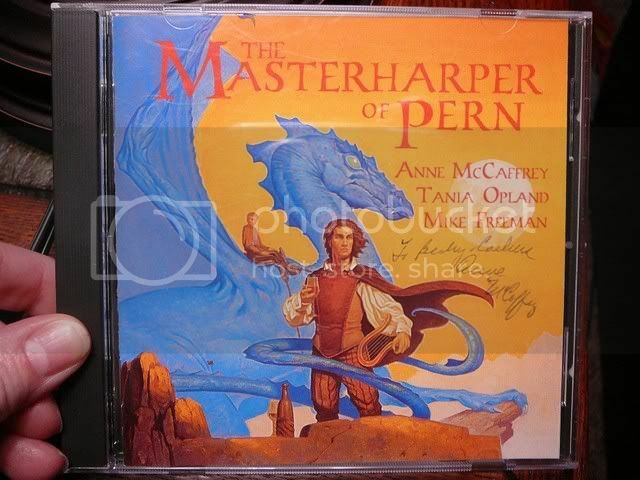 As many of you know there was a CD of Pern music done by Mike Freeman and Tania Opland, also using the Masterharper of Pern cover artwork. There was a limited first edition copy run. The back of the cd cover has reproductions of Anne, Mike and Tania's signatures in the lower right corner in a white box. My copy is also signed by Anne on the front of the cd cover. Thanks to Hans I have some more info to add on the CD straight from Mike Freeman himself!! Mike says....."As for the Masterharper CD editions, the first was, I think, 1500 copies with our three signatures in the box of the back of the CD tray. That came about because we didn't have the bar code yet to put in that space, so we decided it would be a neat idea to fill it by signing it. By the time we came to a second pressing, the bar code was done, so that first release is the only one to have the signatures. The first edition also had an eight page booklet inside with more detailed notes on the tracks, while following pressings had a four page booklet. In every other way the CDs are the same, and there have been no changes since then. We also personally signed a few on request, and attendees at DragonCon were able to approach all three of us for signatures there. Those would be signed wherever the whim took us - usually by the photos in back but occasionally on the cover artwork." With the success of the cd a songbook was put together also using the cover art. The songbook was done in a 'short run' first edition. Again, I don't know how many copies are included in this 'short run'. Mike also says that there has been only one printing of the Songbook. They also include bits of the art scattered throughout the music. I've heard that if you have 3 or more of something that it is considered a collection. Along with the paperback edition of the book that makes 6 items with the art work, hence the collection within my collection. I don't have dates of when the cd and songbook were originally published, if anyone knows please post. Probably 1999 or 2000, I think. Hans, ever the consumate collector, also asked Mike about any promotional material that went along with the CD/Songbook and here is Mike's reply....."There were a couple of posters/flyers made for our use at DragonCon and local events. One or two stores have a display poster too, and we have a large laminated poster of Brom's artwork for display where appropriate. There's no commercially available promotional material, though we have thought about that!" Great Highlight!! Loved the poster and the newsletter, too. I have wanted the CD and Songbook for a long time, just had not done it. Now they are on their way. Thanks for reminding me. Anne signed a bunch of the song books at D*C. She was everywhere that year. Every time we turned around, she was following us into a booth or vice versa. I did not see any promotional posters at the booth. just getting to see it is a real treat. enough to be able to add Annes signature on it as well. JJ - What a fun time that DragonCon must have been! I went to DragonCon in 1999 and I saw Anne there several times myself that year. She does seem to get around and all over the place! L'isa - So I'm guessing you used the link to their site to order both the CD and Songbook? I hope you enjoy them!! Becky, I have asked Mike how large the short run/first edition is/was in a seperate mail. I had my songbook(s) signed by Tania and Mike and will add a picture here I took of the exterior and interior, in addition to what Becky already posted. A little bit of promotion for Tania and Mike would be in its place here Do go to their site to order both CD and/or Songbook. I think they'll make a better profit on it then when you dowlonad from iTunes - which I love, don't get me wrong But in this particular case I would much rather have the CD with jewel case! Last edited by Hans; Apr 10 2008 at 10:26 AM. I love how they signed your copy of the songbook, Hans! It's perfect! We've got one person ( L'isa) to go order both CD and Songbook so that's a start. 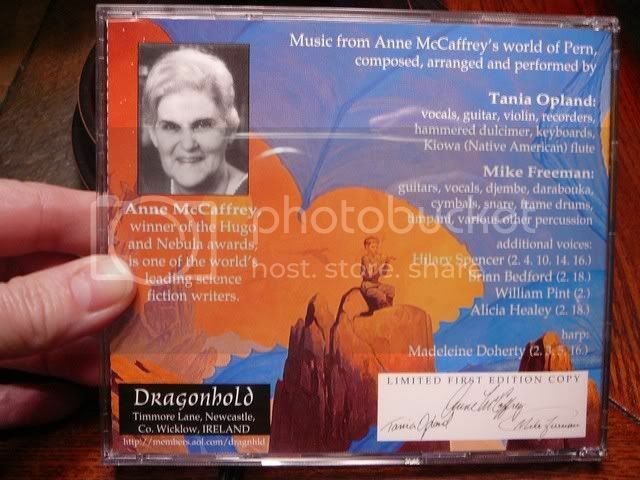 And maybe if a few more folks order we'll get the new CD of Menolly's songs by DragonCon as promised! 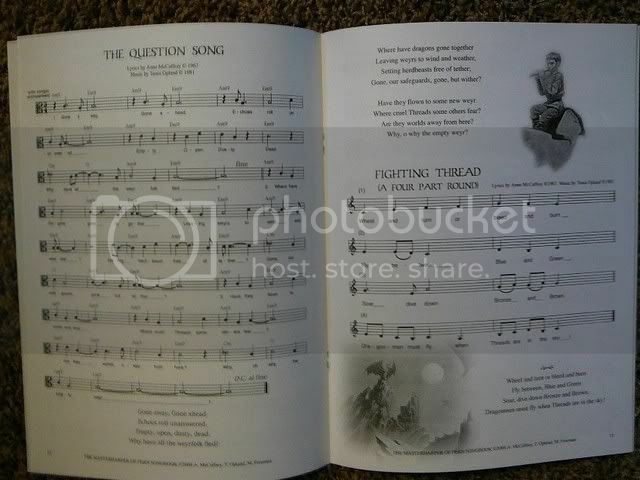 And postage (of the songbook) is included in the mentioned price, folks (I was pleasantly surprised by that! Thanks for the link Becky, I hadn't missed it but planned on repeating it which I obviously forgot! Me too, Hans!! And I wasn't smart enough to ask them to sign the thing. Live and learn! Thanks for mentioning that, by the way. 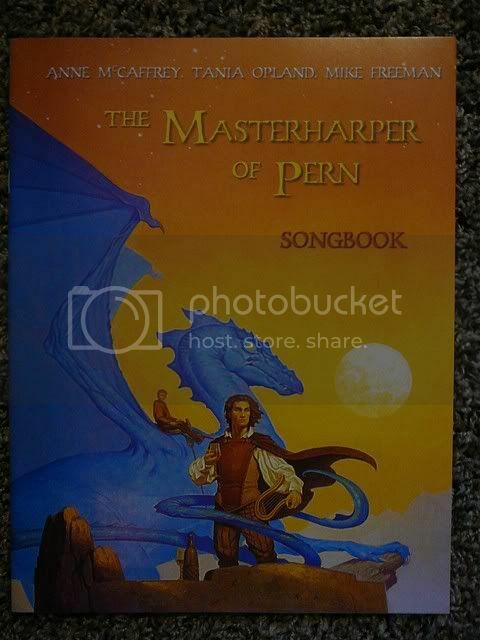 Got Mike Freeman's email this morning and he told me there were 1,000 copies made of the Masterharper Songbook. This is true! But.....I don't read music or play an instrument so having two copies just doesn't make sense......at the moment. Now maybe in a few months, weeks or even days my mind will change. Thanks for letting us know how many copies were issued, too! And thanks to Mike for all the info he gave you to pass on to us! I think perhaps its time to order one of these for myself...especially if I ask politely they might sign it for me. then I will be able to add one more piece to this hopefully growing mini collection!!! LOL, Maelin!! Hope you get it soon and enjoy the signed copy!!! I'm going to have a look at it myself now. Thanks for putting it up! Now it's ordered! I got them!!!! Beautiful. But they ship so quick I did not have time to send an email and ask to sign them. Oh, well. But they are just gorgeous!! Yep, they sure do look great. I like the CD but the Songbook cover, being so large makes the art look even better. 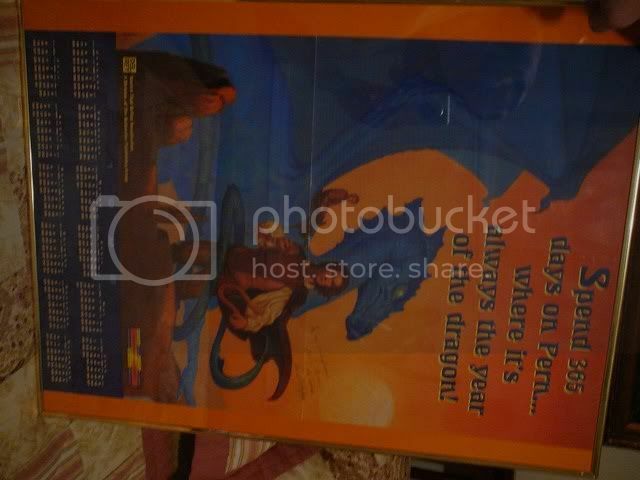 (of course the calendar is best, but I can't look at it as often as the Songbook, that's easier to handle.) I'm sorry you didn't get yours signed either.....join the club! Why not send them back with a self addressed, stamped envelope and a note explaining that they were so wonderfully efficient that you hadn't time to ask if it was possible to sign them? Lisa, that sounds like a great idea that Cilla has...just pop them back in an evelope and ask them to sign them...I bet they will be thrilled to do it for you. Hmmm, I'll have to think about that. It's a super idea!!! Yes, that does sound like a great idea. I am going to do that. I think I ordered them and got them within 3-4 days. I think they mail out the day you order. That was the fastest I have ever gotten an order. As long as their at home...but it might take longer if they are in Ireland or on the road touring. Very true, Maelin. Maybe an email to them thru their website asking if they'll be home first should be done. Good thought Maelin! !